Britt "Why didn't you use the veto on Kevin? Bruno "The only thing I would ever say to him was Hey Bud!" 4:20pm – 4:30pm In the living room – Britt tells Sarah she told Pili that she would eat slop for the remainder of the time (just to see a family member). She says just from looking at her face she would be able to tell if she is doing good or not. Sarah starts crying and says that she can’t even picture his (Boyfriend Scott’s face). Britt says it hasn’t been that long. Just a few more weeks. We’ve done this long we can do anther 20 days. Sarah says I don’t know if I can do it.. I can’t pull myself out of it. I would do anything just see his face. I just hope he is proud. Brittnee says I’m sure he is. Sarah says having the backyard would make things so much easier. Brittnee says just some fresh air. 4:30pm – 4:50pm In the bedroom – Britt asks why didn’t you use that veto on Kevin? Bruno says because Kevin wanted me out of the house… more than say Zach would. Well maybe the same. I didn’t really bond with Kev. I hadn’t talked to him in 40 something days at that point. You’re still going on about that eh!? I am telling you it wasn’t a planned thing or anything. Britt says I was just thinking about it. You could have used it on Kevin and he would have stayed. That would have been a guy I guess. Bruno says yeah but Kevin wasn’t close to me… I’m not even going to say that Zach is but I literally hadn’t had a conversation with Kevin for 40 whatever days. Like literally we never talked. Like at all! The only thing I would ever say to him was Hey Bud! And Hey! for 49 days. Isn’t that crazy. The most he ever said to me is when he came into the pantry and said hey the girls are working together you should keep me. That’s the most he ever said to me. Britt says yeah working together .. interesting. For me Kevin there was definitely no chance. 5:25pm Big Brother puts all the house guests on an HOH lockdown. The POV could be starting in the next little bit. Likely when the call Pili the POV host to the diary room. 5:40pm Big Brother blocks the feeds… The Power of Veto competition is likely happening now … Who do you want to win the veto? 7pm The live feeds are still blocked. Because he is a moron and pezzo di merda! It’s comical how much you dislike a reality TV show contestant. I’m not sure who you are, but I’m genuinely worried for you. “I’m not sure who you are, but I’m genuinely worried for you.” — Genuinely LOL! I’m a Kevin fan….and I think Bruno made a good case as to why he didn’t use it on Kevin. … But the real question is “Why did he use it? ?” Or “Why didn’t he use it on Pilar?” .If he had not used it, sure risk girls alliance… so OK. But if he used it on Pilar, he might have been able to work with the two “diaper” girls after their boys are gone ; he could have worked with the other side girls (Sarah/Britt). Bruno would have helped them get out the “big two”, thus solidifying a final four with Sarah/Britt/Bruno and Godfrey. Would have had better chance to make finals that route. Right now….after this HG Power gets played, Godfrey is going to be in a very good position with both sides (basically the position I described for Bruno above). Bruno is gone next HOH …unless he can pull out another win…but there is no one that will help him THIS time! Britt and Sarah may leave Godfrey on the block. They are exasperated enough to not care if he goes even though he iscurrently their most probable ally. Bruno using that POV on Zach endangered Godfrey and Godfrey knows it. Bruno would never have used it on a woman nor would he ever work with a woman. I feel he is very chauvinistic and thinks he can’t lose to a woman. I am so not a Bruno fan at all. I don’t hate him but I have no respect for him at all. Bobby set Bruno up for the upcoming weeks, so he thought, by spinning and exaggerating Bruno’s assertion that there is a girl’s alliance. Bobby heard nothing at the hot tub door but decided to spin a huge lie, the same guy that lied about having a veto. It is to funny how Bruno now believes and fully embraces the idea that an alliance exists. His sketchy behaviour this past week and the vetoing Zach only works to instill mistrust from the remaining HG’s…including Godfrey. Depending on how this power works either Zach or Bruno are gone. I think Bruno used the veto on Zach as opposed to Kevin due to Chop Shop thing (aka the idea o them being in alliance since the beginning even though the relationship between them has gone a little bit down south at times due to the circumstances) on one hand, and, one the other hand, probably Bruno considers Zach a little bit more trustworthy than the other house guests. Let alone he has nobody reliable left for his game. Will Scott be waiting proudly for Sarah and Willow when they get back? Earlier in the season Sarah explained on more than one occasion that her relationship with Scott is open and does not limit them to one another. Not all relationships are monogamous, but nice try. Never implied their relationship was monogamous. Scott is probably very excited for their return. didn’t seem to be a problem when naeha and scott went out to lunch together today. I wouldn’t put any stock into their tweets .. they don’t know any more info than we know. Yea I am definitely not thinking of someone returning to the game….maybe something more like in BB US Season 10 (?) when Brendon had his Pandora’s Box and Rachel returned to the house to torment the HG’s while he was locked away…Idk. It’s likely it is nothing though. If they enter the house, I would think it will be just to host a competition. Since after this week, everyone plays in ALL competitions. Excellent point at F6 usually a guest host. It won’t be a juror. Twisto’s is just banking on net traffic. “Expect the unexpected”…. Not that big a deal if they are just acting as an announcer. If that’s the case…..Kevin all the way!!!! That guys got the gift of the gab! Expect him to be “front and centre” on the BBCan3 tour! PS: don’t consider voting Godfrey. He might play it safe this week. Especially if he wins the POV! I think Godfrey would use the power. He WILL use it. He’s forced to change at least 1, The problem is we don’t know if he’s willing to Save Sarah and/or Brittnee as well. That’s why it could be a trouble. I don’t want to bet on that! I’d feel fairly good about Godfrey winding up with the power….. think he’d go straight for Zach’s jugular. But then again, what the hell do I know. I never would’ve predicted Bruno saving Zach, Brittnee nominating Willow, then Sarah saving Pili. Godfrey would definitely save Sarah. If she is on the block with anyone else Sarah goes home. Godfrey is fully aware of this and wants comp threats out. JenGee. plz don’t not worry about the votes. production is going to give it to sarah and brit even if canada votes for other house guests. I m starting to like britt and I think she deserves something from this game but sarah needs to go home ASAP. can someone tell me what sarah has done to this point of the game. if she makes it to final two she would have nothing to say in her speech. Victoria from BB16 has won more comp than sarah has so far. also don’t forget that she is the reason willow(her final two) is in the jury. B is the reason willow left. How was Sarah supposed to know the boys were ditching Kevin? Also, if Bruno didn’t pull zach off, WILLOW WOULD STILL BE THERE. stop hating on Sarah. They have limited info in the house so it’s so easy for us to judge their decisions. it’s Sarah’s fault that B is jealous and possessive of Sarah? what parts SuZQ? why don’t u answer the question of what sarah has done in this game so far? LOL. If not for Sarah sending Jordan home (who is somewhat loyal to her but is not his number 1) Godfrey, Bruno, Bobby will be decimated and we will be watching a replay of BB17. Sarah sending Jordan home is by far the riskiest move on her part because he is the only person who is protecting her from the diapers (Zach). Zach who is blinded by Bruno wanted Sarah gone but it is only Jordan who keeps telling him that he can control Sarah. Also the side that she chooses to align with Bruno and Bobby will still keep targeting her even when she sided with them. carlos u do NOT make sense at all. sindy was responsible for sending JP home. plz watch the show first than comment here. To put that blame on Sarah IS a dropping of BS, Brits reasons were that of her own… she is an adult and should be viewed accountable for her noms and held responsible for the results of her noms. Point blank. Sarah did not ‘Tell” Brit what to do, she supported her (B) to make her own decision. I’m pretty certain if Sarah were giving her instruction as to what was better for her (Sarah’s) game she would have said NO DON’T NOM WILLOW. Sarah did say to Brit… do what’s best for your game. Soooo…. Willow being the re-nom and evicted IS on Brit. Sarah and the others all voted strategically in hopes to get the results they wanted. Unfortunately it didn’t work out for Sarah. The owner should use that power depending on the circumstances, not for the sake of using it.What was the benefit of using the secret POV for … Andrew’s girl when she used it on Sabrina? She just used it because … Big Brother gave it to her to use it. serious question. if Bruno were on the block as a renom, would pilar vote to evict Bruno instead of the other one on the block? So basically Sarah needs to evict Zach otherwise it will be left up to Ashleigh, who will definitely evict Bruno. That scenario would actually be hilarious because Bruno has caught so much flak from Sarah fans this week for saving Zach but she might do the exact same thing if given the opportunity. Sarah may have anger to Bruno’s game move but she knows that taking out Zach breaks up a lot of tight ties. If Zach is on the block Sarah will vote him out regardless of who he sits alongside. By the way, I know others have said/posted it, but I wanted to thank you both for this site!!! Great job at posting the insider info and monitoring the site for everyone’s enjoyment! Not sure what your take is from purchases from Amazon thru your site, but I hope it helps you out. Plus followers of this site please help them out with a donation… Or do like I did…shop thru this site on Amazon. Thank you Dawg and Simon!!! Great job! DONT HATE OR GO A HEAD AND HATE (i don’t care). 1. I hope God wins the secret veto then zac wins the POV…wait a minute let me explain…if zac wins, god uses the secret veto and removes himself from the bLOCK then God nominates pili and SARA goes to jury . Favorites aside, Sarah leaving makes no sense for Godfrey’s game strategically speaking. She’s not ever targeting him until final 3 (and by that point it doesn’t matter, it’s everyone for themselves). Sarah and Britt are the closest people to him in the game. Zach wants him gone, as does Ash (because she wants what Zach wants). He can’t trust Bruno. And in his own words, talking to Pilar is like talking to a child. He can definitely straddle the middle if he likes, but Sarah and Britt would bring him to the final 3. 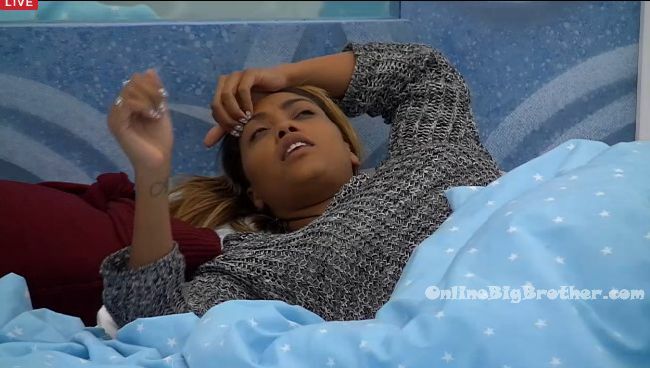 GOD closes person in the game is Bruno… Gotta watch the feeds and global or read here. He definitely has something going with B to. No Sarah in the house this would be an interesting combo but I think GOD stays loyal to Bruno but it’s a guess. Bruno let Godfrey know that Bruno’s allegiance is more to Zach then Godfrey. Godfrey easily could have been the replacement nominee and voted out. After lying to Godfrey on many occasions (like the Chop Shop, Bobby’s veto) Bruno then put him in danger with that move. I’d have to agree with Hann on this one. First, Bruno/Bobby withheld the Chop Shop info from God & when confronted about it they lied. Bobby slipped and told him something different than Bruno making it even worse. Then Bobby & Bruno lied to him about the secret veto. Also, God heard back from Kevin when he saved him that Bobby/Bruno suggested back dooring Godfrey and were pretty adamant it should be God or second Sarah (but Bruno knew Kev/Sarah got along so he pushed more for God). Further, in various convo’s God kept hearing that Bruno was suggesting God could go anytime. And, Bruno kept making God promise that Zach would be the number one target (even the day of the triple eviction). The Zach save was the last straw for Godfrey. He is a free agent first and foremost but I believe God would take who he thought played the weakest game. Ideally for him he’d rather play the role of agitator (which he is brilliant at). He is probably the only guy who wants the 4 girls and him at F4. He could keep Ash/Pils targeted on Sarah/Britt & vice versa and skate the middle. He could also pull out a pivotal HOH & POV’s would be easier to win. I suspect he would take one of the showmance dimwits to F2 but he might also take Sarah or Britt simply b/c of the number of friends those 2 girls would have in jury. Even sitting beside Britt (& even if she won additional HOH/POV’s by that point). Out of all those men who used showmances or made all those alliances for him to get there by shear intelligence & social game he could very well be a game winning story. . The God/Bruno relationship is interesting. I remember the look on Godfrey’s face when Bruno used the veto he was pissed. Long before he discovered a girl named Sarah in the BB house he was hanging with Bruno. I get all the arguments about things not going smoothly that goes both ways. GOD trying to butter his bread on both sides to. Keep cry babies and work with Bruno. The question is who betters GOD’s game? Sarah or Bruno is the question. I think he has B as his number 1 and not for comps. After Zack goes maybe we see more. I just can’t see him trusting a manipulator like Sarah. GOD wants to be the master manipulator in the house IMO. I mean if Godfrey saw Sarah as manipulative, then he should Bruno no differently if he’s caught on to any of tge stuff we know. Sarah and Bruno have played incredibly similar games with the differences being that Bruno can win comps, and Sarah is more persuasive. The different between the two of them in relation to Godfrey is that Bruno has lied to him far more often. Sarah on the other hand has told him the truth. I don’t think Godfrey would mind at all being the last guy in the house. He could either win HOH himself or let one of the girls win and then go with that side. I can see him sticking with Sarah and Britt, if for nothing else the company. Lol Godfrey wouldn’t know what to do stuck in that house with just Pilar and Ash. He has a good claim for the win either route though. He’s played a near flawless Coaster game as a free agent. Thanks TTOTambz. And I agree with you. You made great points that I was thinking about myself. While Bruno and Bobby lied to him about the CS, Sarah fed him crumbs of truth. I think that in conjunction with the other lies he’s caught Bruno in is why he tells info mostly to Sarah and Britt. I’m not saying he trust them 100%, but I think he realizes they are the least likely to stab him in the back, and would bring him to the final 3. Godfrey is one of the best Coasters I’ve ever seen. He’s played a wonderful free agent game so far. Godfrey’s free agent game has been great. Pili and Ash were after him but that target seems to be moving to Bruno. I think you mean final five, if Bruno and Zach are gone. God will move to get Zach out and maybe Bruno but he might wait and let Sarah go first, again the meat sheild scenario. I would love to see God, Sarah and Britt final three! Especially if it is a final three to keep the jury to nine. I don’t think Bruno would leave a team of four to join a team of three. unless godfrey or britt were hoh and then it would be: hey old buddy old pal we good we good fistbump, lets get those kids I always hated them you know I wanted them gone the whole time we good we good we good wink fistbump we good. Anyone but Zach wins POV. Zach is 100% gone if he doesnt win veto which is glorious. Even without the special power this week, it would be in Godfrey, Sarah, and Britt’s best interest if Britt won POV. She’d take Sarah off, and Bruno would go up. Then all BGS would have to do is exploit Pilar’s very rational fears of Bruno and Fembots and Pilar would vote out Bruno. I’m glad that of the two goblins, Pilar has developed at least a slight game sense. Bruno would take her out in a second if it allowed him to wiggle further up Zach’s (and to a less extent Ash’s) backside. Feeds are still blocked? Here’s hoping Anyone but Zach or Bruno win POV. It would be TV gold to see the looks on both their faces when they end up the final nominees this week. Well the week comes down to Zack winning POV and not many of us want that to happen including me. Production gotta do questions please. Anything can happen. Bruno could use on GOD to put B up one less vote to keep Sarah. B takes Sarah off the block. Only if the 2 competing for SP do not know til after the POV ceremony. That to me is another key in the farce. What if the POV holder wins SP as well? What a hot mess. And when do they know that. This does not consider POV holder. Who’s on the block after SP used. Sarah or B – noms Zack and Pili. Don’t think we’ll see Sarah trying to not upset Pili and leave GOD up. Putting up Bruno this late isn’t going to make him happy and your just a pawn this late you might as well stick your head up his behind. B definitely renoms Pili and Zack no brainer. Though did I mention the triple no brainers. Bruno- 2 ways to go. Zack and Pili means he saved Zack a week only. But perhaps leave Sarah up and put up B removing GOD. Or perhaps it’s Pili up. God Zack and Bruno evict Sarah. GOD- most interesting of the likely choices. He has connections all over but importantly the girls. He won’t be able to discuss his decision with Bruno a good thing for Sarah. Guessing he gets Zack up versus Pili. This has negative consequences for Bruno but gotta happen. Best for Sarah ss GOD sends Zack home rather than B or Sarah doing it. Zack/Pili- Can’t see either being a have not. Is there a way Zack stays…. sure win POV then don’t use it. Alternatively need 2 votes from HG’s Ash saves Zack at 2-2. Only a fool lets Pili vote she has to sit beside Zack. Second only GOD helping Bruno to save Zack works. I’m betting they aren’t allowed to talk and GOD votes Zack out could be 4-0 easy. Easy week for feeders if POV won by anyone but Zack. Cry babies/diapers/Black & Bru 2 couples gotta get together. No ones splitting up in my opinion. As usual HOH will put folks together or drive them apart. Zack being evicted and if your a Zack fan don’t be sad his social made it highly unlikely he’d win the money any way. Thanks for the analysis Stan, always a pleasure to read. If Zach goes this week how does the house settle? Do the garblins become real? Does Ashleigh/pili go after Brittnee/Sarah? Do the girls go for a no mans land options and take out Black/Bru? Does production ruin these last 3 weeks with more twists? Ashleigh spends two days in a fugue state. pilar wonders what happened for two days. Bruno tries to get back with Godfrey. Godfrey eats a chicken. Goes back to Bruno if Bruno is hoh. Sarah and Britt celebrate, try to team up with each of the other pairs, Sarah gets blamed for everything even if Britt or Godfrey had the have not power and they’re back on the bottom of the order again. OK my take: First high fives by everyone in the house except Pilar and Ash…. Then Godfrey will approach the “diaper girls” make a deal….then Godfrey will celebrate with the “other girls” and based on how Zach was put on block…prove his trust with them. Poor Bruno will be in scramble mode….running to Godfrey for help/support/meat shield (but Godfrey is not that stupid). Depending on the two comps( HOH/POV) for next week…if Bruno does not get one of those…he is gone right after Zach. Now the girls can either work with Godfrey to get our the opposing girls out…or join and send him out next. Debatable as to how this will play out….how badly do they hate/distrust /willing to work with ….each other. We might just see a girl top four???!!! Definitely a top three if Zach goes then Bruno. IMO….I really don’t see Bruno being able to get the votes to fight to stay…and Godfrey knows when to dance away… But…it all rides on Zach losing POV today! If Brit or Sarah or Pili win HOH, ashleigh and pilar will make a girls alliacne with them to get Bruno out. I’d want in this order F2 Pili, Ash, B, GOD, Bruno and please note IMO she loses to B, GOD and Bruno at this point. I think it’s very hard to expand votes beyond diapers for Pili and Ash. 3 votes won’t cut it my guess. If crybabies heads up I just think Brit has better arguments for the money. GOD on charisma alone. Bruno games respected inside the house and jury. Sarah needs to sit by a girl IMO to win the money. I think that’s the Jury pecking order with Bruno most likely if F2 down to Pili who I like with no chance unless versus Ash and very slim. B best of the girls and Sarah right behind. Zack never makes F2. By the way the reason I have GOD slightly ahead of B is the whole blood thing. She argues moves GOD has the charisma. B likely deserves it more but I think GOD 6-4 or 5-5 Canada casts the deciding vote. Of all the girls I’ve liked B the best and she’s flawed like all of them(HG’s). If she would just stop crying…………. Thanks for posting the clip Simon. Some people were acting like Sarah started yelling first when clearly it was Bruno. And then he bucked at her? Wow. She rightfully called him out for saving Zach. She was trying to save Willow. She made a mistake and saved Pilar. She was telling Pilar the truth the following day so it’s ironic you’re calling her a snake. But regardless. Sarah’s strength in this game is her social game. She’s not as manipulative as Dr. Will, but she’s incredibly persuasive. If that makes her a snake, then so be it. Many players described as Snakes have won. Will, Jun, Dan, Andy etc. Unlike Sarah, Dr. Will played the game with great panache. I liked the most the unparalleled elegance he played the game with. So Bruno isn’t a snake because for the past three weeks he has been telling Godfrey, Britnee, Sarah, Willow and Bobby that he is gunning for Zach yet he saves him last eviction and then created a final three with him and Godfrey? After that he told Godfrey that he is still gunning for Zach. So Godfrey isn’t a snake because he had a final three with Bruno and Zach yet also created a final three with the goblins and is really close with Sarah and Britnee? So Zach isn’t a snake because he is in the middle of all the alliances inside the house and whoever has the power that week will be where his loyalties lie? Ashleigh is a part of the chop shop yet wants Bobby out two weeks after its creation and joins a different alliance. Either way she doesn’t really matter she is just a shadow of Zach anyway. Britnee was working with Bruno and Godfrey but the day before nominations she was telling Ash and Pili that she wants to get those guys out. Honestly though, how come Sarah is the biggest snake when those other people have created several deals to keep themselves safe and go further in the game? hate it or not but Pili is the only one who has been particularly loyal. From the beginning she has been loyal only to the diapers particularly Kevin and Ashleigh, even when Zach voted to get her out she still wants to go to the final four with him, Ash and Godfrey. If you want an honest and morally good player to win this season then Pili is the rightful winner. Wonderful breakdown Carlos. I’m not sure I’d say there are any true Floaters, (though Bruno’s becoming one now that Bobby’s gone)but people are defintely using similar tactics. Practically everyone has lied or thrown someone under the bus at one point or another, so why should Sarah be singled out like she’s the only one? She’s been loyal to Britt for the entire game. The only times she’s “thrown her under the bus” are when her and Britt were trying to make the other HG’s think they weren’t so close. Nice ploy, but it was never going to work (everyone can tell how they naturally connected). The strategy that people employ is of no consequence. Play to your strengths be that Leader, Gamer, Floater, Coaster, Collaborator, Snake; competitions, strategy, social game. All I ask is that players actually play the game. There are so many people that would love to be on this show, and people who do nothing are universally the worst. Oh please. Its an argument between adults. She isn’t innocent in all this either. She’s trying to deny the fact that she was trying to come after the guys with a girls alliance, which we know is true. What I find funny is people who support Sarah, support feminism, which advocates for equality, are upset at Bruno for treating her like and EQUAL. The “How dare he yell at a girl” argument total contradicts equality. I never suggested Sarah was “innocent.” She’s one of the few players who have been playing all season. What in the world does bucking at someone in an attempt to aggressively make them back down have to do with equality? Anti-Sarah/Feminism posters keep posting this whole “it’s only equality if he can yell too!” Well that’s just it. Sarah didn’t yell or buck at him. She called him out (rightfully) and Bruno blew up. I’m all about equality, but Sarah didn’t blow the situation up. Bruno did. Why was it right for her to call him out? Is he playing this game for her best interests or his own? Sarah hasn’t done crap, she’s been the ultimate floater. All season she whines and cries about everyone else and how superior they are. She tried to make her big girls alliance move and it blew up in her face. Now she lost again and what does she do? Cry! However once again production decides to fix the show in her favour. This is why BB is becoming a joke and why Survivor is better. At least with Survivor their’s consistency with the rules. This show just caters the rules to whoever they want to win. You’re welcome.. I wish we could watch the entire thing. I’ve b1tched about this season alot and will probably continue to do so but It’s improved by leaps and bound these past few days. All I know is if Godfrey, Britt, or Sarah go, expect another crazy twist that will most likely favor the remaining two. because Sarah, Britt and Godfrey are the darlings of Big Brother production? admittedly, sarah gets a lot of D/R time. a LOT of D/R time. on sideshow, they asked bobby the evicted houseguest about games they play when the houeguests get bored just to show a clip of Zach getting hit in the balls. and then asked him his thoughts on Zach getting hit in the balls. Zach has gotten more face time on every episode of Big Brother and Sideshow episodes than every other houseguest combined. i’m surprised truly that the have not power wasn’t saved for him. I honestly thought it would be. ash wouldnt want pili gone before zach and puttng him up now with a secret power is a n obious move not as likely to cause dramatic wit ash. so bruno wit pili. theer is no way to say tt zach would leave if god or britt was up due to who is votin. Bruno and Godfrey have both said if they get power they will go after Zach. winning the secret have not comp would give them that chance. did they say if the have not comp gets played on eviction night or the day they become havenots? I’m going to assume the have nots will be told tomorrow but the competition I don’t know.. It has been answered by arisa. I have mentioned parts of this in other threads.The SP is used right before the eviction ceremony and long after the POV ceremony. So It’s likely have nots announced in the AM. POV ceremony late night Saturday or Sunday morning. My best guess(been wrong usually :P) is they won’t disclose the SP comp until after the POV ceremony. They have a lot of control on timing. If one of the SP players won POV hope they’d be smart enough to let the POV be used 1st. It won’t help this hot mess to have the POV and SP holder be the same and know everything before decisions. What I’m basically pointing out they can announce have nots and not disclose SP until after the POV is done. What about if the POV is played? Who is safe? The person who won the POV originally, the current holder of the POV, or both (per usual)? I assume the original POV winner is safe. the global site says holder. not winner. imo if it’s used the winner is fair gameand the person it’s used on is safe. but I could just be wishful thinking. lol. The POV winner remains the POV holder. Should they choose to use the veto they are not subject to be considered for renom. It seems the rational from the Global site is that someone that has won safety via a comp (HOH, POV) is not subject to be nominated through the Special Power. Let’s not complicate this to much. I really don’t see Zach staying unless he wins this POV..
so, if Zach wins veto, Bruno goes to jury I assume. of two minds. another of the personalities I don’t like, but I don’t hate his gamesmanship. Ash is always posing and giving looks like that. She is 21 and seems very concious and aware that there are cameras watching her, and she’s playing it up for them. I was a fan of Willow from the beginning. She was really stepping up her game. I was interested in how she would progress. Godfrey needs to get his shirt back from Bruno. Nothing innocent about that game move at all. lol, you’d both outlast me. i’d be the first evicted. they’d put a turnstile at the front door that’s how fast i’d be gone. yup, less tv time than risha. imagine a bb season of all the first evicted houseguests. Isn’t this the same power as Jeff had on BB11 US? Would be funny if we saw another Sheema incident. Sarah’s days in BB house are numbered unless Bruno, Zach, Godfrey and, possibly, Brittnee get evicted . Dawg n Simon provide the best BB site in the world. is the sarah pov symbol at the top of the screen a joke or a real thing?